Puzzlefighter is always looking to try luxury sushi restaurants with me, and I would agree to go on the condition that I have not blogged about the restaurant before. To Puzzlefighter, the fancier the better, as long as it's traditional-style sushi. After making around 10 suggestions, all of which I declined, he finally suggested Kamei Royale. I did already have a post on Kamei Royale, but since they moved to a new location, I suppose it was worth a new blog post. How did I find out they moved to a new location? A few months ago, they invited 250 guests, including many of Vancouver's leading food bloggers, to a grandiose tasting event for their new location, and I found out through the blog posts all over my social media feeds. Yes, they dared to not invite me. 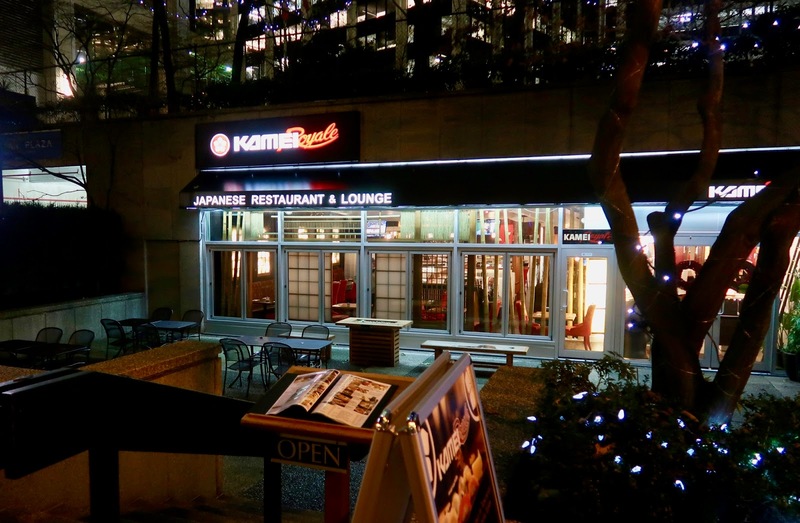 Kamei Royale is an authentic Japanese restaurant and has been around for decades. 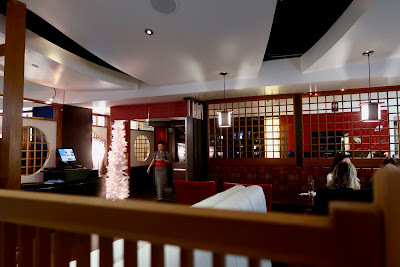 It used to be the largest sushi restaurant in Greater Vancouver (by area) and was conveniently located near Burrard Station. Their new location is just a few steps away, but in a much more hidden location. By the time we actually located the front entrance to the restaurant, Puzzlefighter was already half frozen. Inside, the dining area was well-decorated with Christmas trees and ornaments and appeared to be roughly as large as that of the old location. However, there were a lot fewer diners than there were before. Wakame - This came with thin strands of regular green wakame intertwined with red strands of spicy wakame. I kept reassuring Puzzlefighter that the red wakame would not be spicy (as none of the red wakame I have had before was spicy), but it turns out I was dead wrong. Deep-Fried Shrimp - This was lightly spiced and savoury. We both enjoyed this one. Yasai - The Yasai was a mix of spinach and shiitake mushrooms. 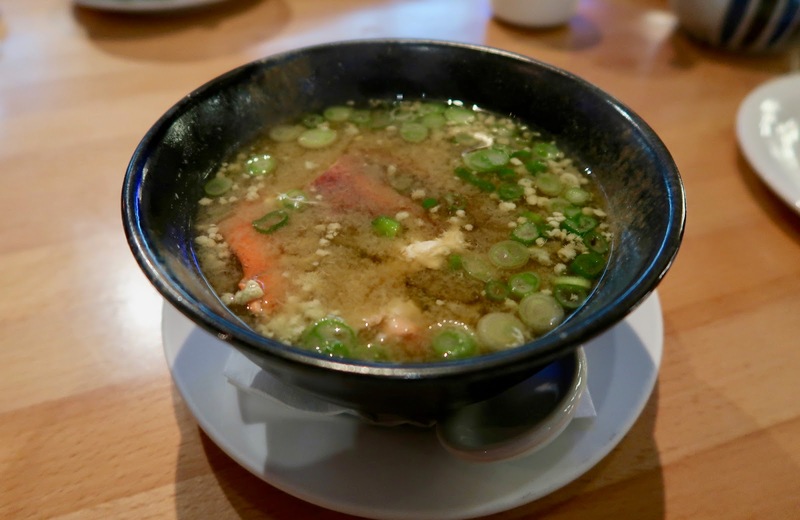 We found the light dashi broth refreshing, and I could taste a bit of mirin in the broth. Fresh Marinated Salmon - The fresh, creamy salmon had an excellent smooth texture. It was dressed with an interesting combination of mustard and olive oil, which had an acidic zing that I found slightly heavy. Tamago Tofu with Ikura - This had the texture of tamago and the mild flavour of tofu. It was an interesting combination, but it tasted a little strange to us. Duck Breast - The rich creamy sauce on this one accented the rich flavour of the duck breast. This was another well-executed one. Ankimo - The monkfish liver was the highlight of the entire appetizer platter. The Ankimo was extremely soft and just melted in my mouth. Carrot and Radish - I liked how this was marinated to produce a nice pickled flavour. Kinpira - The thinly sliced lotus root was crunchy, marinated, and slightly spicy. 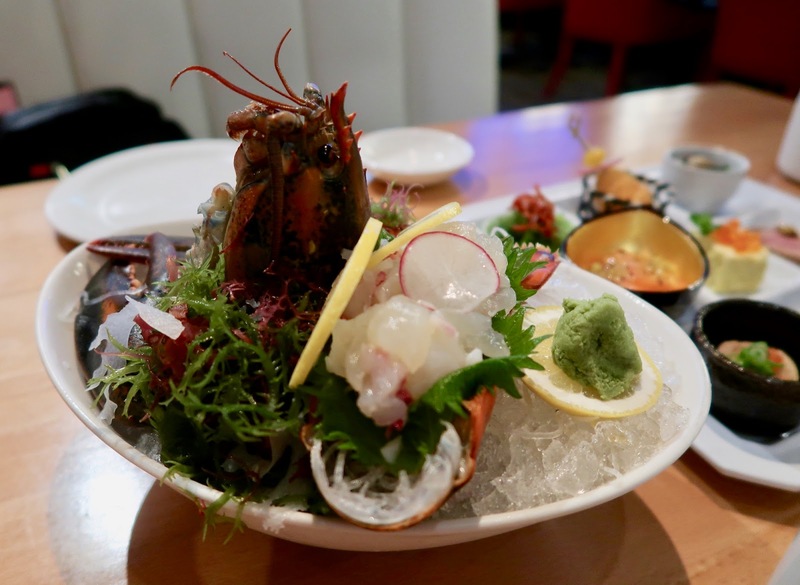 Since we couldn't get lobster sashimi on our last adventure together (we didn't have enough people to finish the special lobster dinner), Puzzlefighter had to order the Lobster Sashimi this time. This dish comes with a 1- to 1.5-pound Nova Scotia lobster. It had the exact delicate sweetness of amaebi but was meatier and juicier. Our faces were filled with happiness the whole time we were eating the lobster sashimi. There weren't very many pieces of it, and we ran out very quickly. After finishing the Lobster Sashimi, they took the head and claws and made a miso soup out of them. The soup had a light consistency and didn't absorb much lobster flavour, but the lobster meat itself retained an enjoyable sweetness. 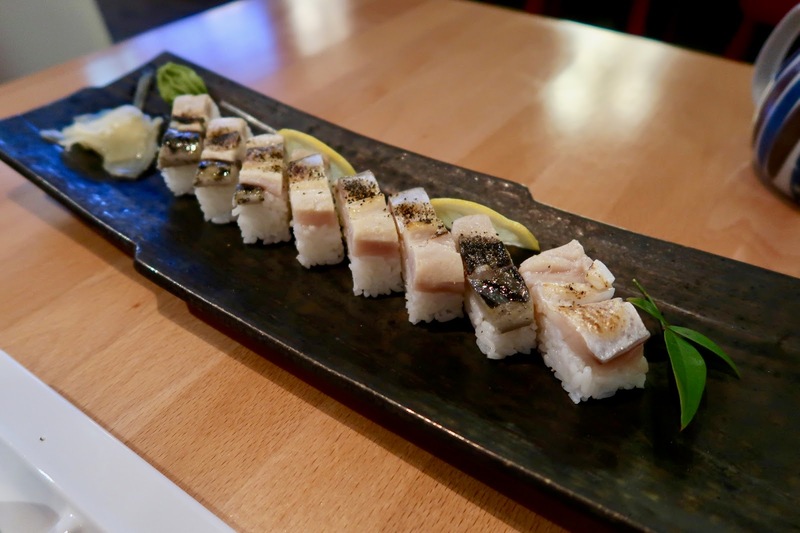 The Saba Aburi consisted of 8 pieces of torched saba in the traditional oshi style. The saba was fresh and not fishy. The amount of vinegar in the sushi rice was just right and worked well with the saba. I also enjoyed the soft texture of the saba, though I thought it could have more of a seared flavour. 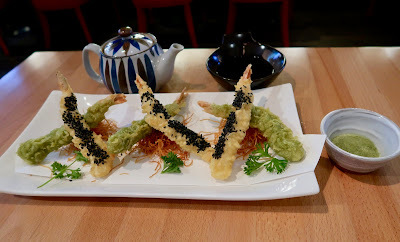 I am a huge fan of anything matcha, so when I saw that the Prawn Tempura came with sesame and matcha tempura batter, I had to order it, even though I had no clue how matcha and prawn tempura could possibly work together. Well, it did not. The matcha was obscured by the savoury flavour of the prawn. I tried to smother it in the matcha powder and the tempura dipping sauce to see if that would fix the problem, but it turns out the matcha powder was salted! Imagine my horror as I took a bite out of my heavily salt-laden prawn tempura! Despite all that, the matcha tempura would still fare well as a regular piece of prawn tempura. The sesame prawn tempura was the better of the two. The sesame seeds added crispiness and a unique, nutty flavour to the tempura. Matcha Ice Cream - The ice cream was decorated with a caramel cracker and had a remarkably rich green tea flavour. 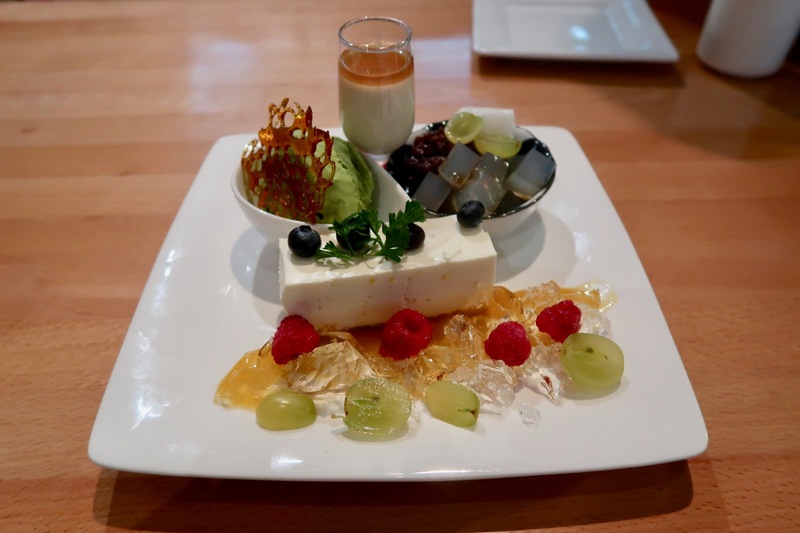 It did not taste like something that just came from the supermarket, and Puzzlefighter was disappointed that you couldn't order the Matcha Ice Cream by itself. Tea Pudding - This had a milk tea flavour and was really tasty when mixed with the red bean in the Bowl of Red Bean and Jelly. Unfortunately, the pudding was too soft to be scraped out by a fork, and we were not provided with a spoon small enough to fit inside the mini glass. The struggle was real. Bowl of Red Bean and Jelly - This came with a lot of red bean and red bean sauce. The sweet flavours went well together. Cheesecake - The Cheesecake was made with cream cheese and was topped with blueberries. We did not find this particularly remarkable. The service was very polite, and the servers came by regularly to make sure our tea was refilled. Overall, I found the food to be very consistently well-prepared. 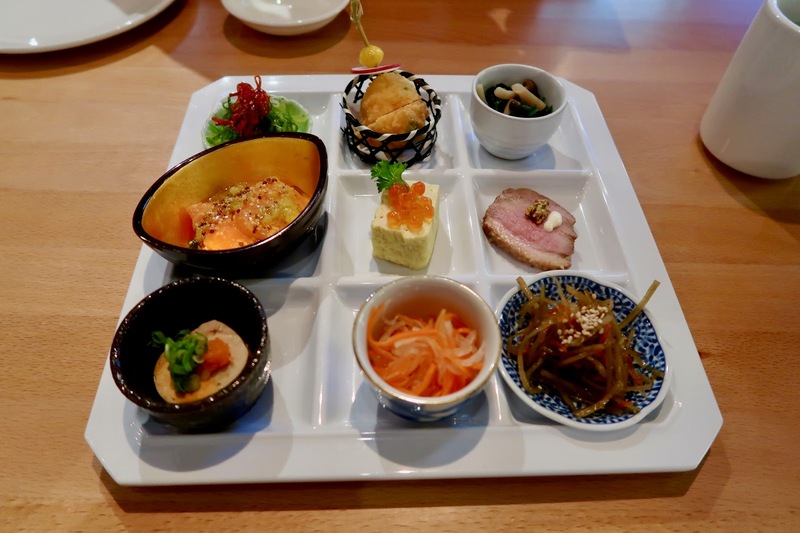 The quality of the food was much higher than what I experienced during my visit to Kamei Royale's old location, although I'm not sure if this was because I ordered more deluxe items this time. The deluxe items did cost us and the price tag for this dinner was over $100, but both of us left feeling satisfied.